Sheffield’s ancient woods are the envy of other English cities. Many of the woods we use as short cuts, walk our dogs in, or visit to see the spectacular displays of bluebells, were known to our medieval ancestors. But in those days – and until towards the end of the nineteenth century – they were working woods. 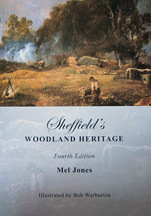 Sheffield’s Woodland Heritage 4th Edition by Mel Jones recounts the fascinating history of Sheffield’s woodlands: of the traditional management techniques; of the old woodland crafts such as charcoal making, basket making, coopering and clog making; of the age-old techniques of building in timber; and of the clues to Sheffield’s past that still remain in the city’s surviving woods. Illustrated with colour photographs and line drawings, diagrams and maps by Bob Warburton, this is essential reading for local historians, naturalists, conservationists, walkers and everyone interested in Sheffield’s pre-industrial heritage. This is the fourth edition of the book that was first published in 1989.